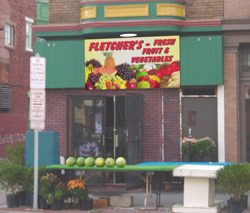 The fruit and veggies for this 4' x 8' sign was digitally shot in our studio. We used a couple of programs to "rip" (raster image processing) the file from 1.3 mb to 5 mb to the finished file size of 580 mb before we printed it. Standing directly in front of the sign, not a bit of jaggedness can be seen.